Whether with Heraclitus, Ovid or Herman Hupfeld ... change is a constant that we encounter everywhere. We know it, but we also like to repress it. When I founded the publishing house with my son Frank Ananda in 1993, we published a single German-language magazine, GAK Gummi Fasern Kunststoffe. 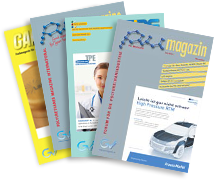 Today – 25 years later, we publish five different magazines, three of them in English, which serve the information needs of readers from the rubber, polyurethane and TPE industries and which are respected and read worldwide. Behind this development, of which I am very proud, I admit, is the achievement of a great many people. People who work in our publishing house, people who write articles for us, people whom we value as our advertisers and people for whom our magazines are important sources of information and who therefore subscribe to them. In 2012, the publishing house’s positive development suffered a sudden downturn following the death of Frank Ananda. Fortunately, my daughter Indira decided to join the company, so we were able to maintain continuity and develop the publishing house in the midst of the tragic changes. Today it is time for me to pass on the baton and place the business in the hands of the next generation. The publishing house has been transformed into a German Ltd. and my daughter Indira, who many of you know from conferences and exhibitions, will run the company as managing director. Some things will change – the tried and tested will remain. That’s probably what you call successful change management! I would like to sincerely thank everyone who has contributed to the success and growth of the publishing house over the past 25 years. Please continue to support us, because only together with you can we maintain the accustomed quality and be an important source of information for our industry. I wish you and your relatives, your employees and companies all the best for the future. Toyoda Gosei has acquired a majority stake in Hubei Rock Rubber and Seal Technology Co., Ltd. Hubei Rock, located in central China, is an independent supplier that provides weatherstrips mainly to Dongfeng Motor Corporation, one of China’s “Big Three” automakers, and its joint venture companies with Japanese and other foreign manufacturers, including Dongfeng Honda Automobile Co., Ltd. and Dongfeng Peugeot-Citroën Automobile Co., Ltd. Toyoda Gosei China said it plans to purchase 60 % shares from Hubei Rock’s parent company, Hubei Zhengao Automotive Accessories Co., Ltd., for approximately JPY 800 million in December 2018. Innovative materials and technology have been a hallmark of all presentations staged at the K trade show in Düsseldorf, Germany, the international flagship fair for the plastics and rubber industry. K 2019, which will take place from 16 – 23 October 2019, will also revolve around the key issues of circular economy, resource conservation and digitisation, all of which will be addressed at exhibition stands and by the accompanying programme. A total of 3,000 international exhibitors are expected to attend K 2019 and showcase their latest developments from the areas of machinery and equipment for the plastics and rubber industry, raw materials and auxiliaries as well as semi-finished products, technical parts and reinforced plastics products. More than 200,000 visitors from all over the world are expected in Düsseldorf to attend K 2019. Choosing the right colourant for plastics is not a simple matter, since each application has its own requirements. Many factors regarding material and processing have to be taken into consideration. The task is not made easier, when certain functionalities are required. Close cooperation between all players along the value chain is advantageous. The development of a TPE-colourant at Finke is a good example how a good collaboration between all suppliers pays off. On 16 January 2019, an alliance of companies from the plastics and consumer goods value chain launched a new organisation to advance solutions to eliminate plastic waste in the environment, especially in the ocean. The cross value chain Alliance to End Plastic Waste (AEPW), currently made up of nearly thirty member companies, has committed over USD 1.0 billion with the goal of investing USD 1.5 billion over the next five years to help end plastic waste in the environment. For several years already, Smithers Rapra organises an international elastomer event. The Elastomer World Summit includes two events under one roof, one dedicated to thermoplastic elastomers and the other to silicone elastomers. Attendees purchase a ticket to one conference, and enjoy unfiltered and complete access to the other. The conferences are held in two adjacent rooms and attendees can freely switch from one room to the other. 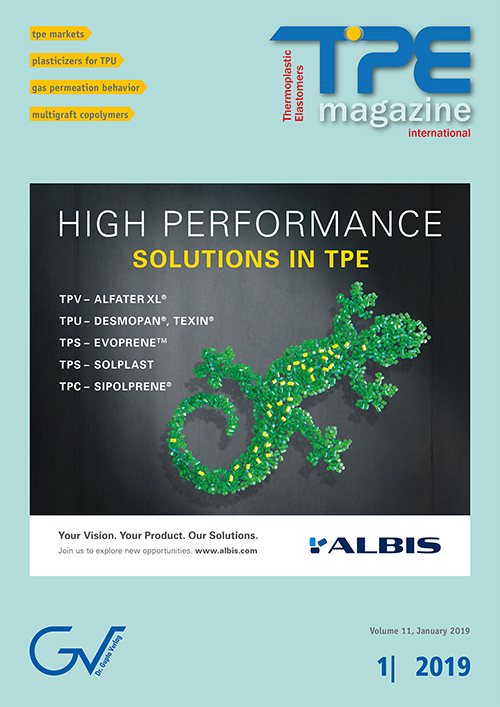 As silicones and TPEs compete in a multitude of applications, the conference is an excellent platform for converters to get up-to-date technical information for both materials and meeting some of the main suppliers. The latest edition of this event took place on 27 – 28 November 2018 in Milan, Italy. An extensive exhibition rounded out the event. Following we publish summaries of some of the papers presented at the TPE session. The TPE industry has enjoyed steady, fairly-high growth for 30+ years based on favorable general properties (elastic and thermoplastic), relatively low cost of the major polymers used (polyolefins, styrene block copolymers, elastomers) and fabrication process advances (coextrusion, overmolding, foaming, adhesion, scratch/mar improvement). As the industry has matured, new challenges are opening markets, creating value-added opportunities and an inflection point in growth of the TPE industry. The outlook for the global car markets in the coming years is rather bad. On the one hand, production plants will have to be converted to electro mobility using large investments, and on the other hand, the demand for new cars is falling. Major austerity programmes to switch to electric cars have been worked out. Porsche, for example, wants to save EUR 6 billion over the next eight years by rationalising its operating processes, while spending more on the development and production of electric cars. The regulatory burden is enormous. In China, there will be an electric car quota of 10 % for new cars in 2019. In the EU, rising CO2 emissions from gasoline engines following the decline in diesel-powered vehicles will have to meet the new CO2-EU targets from 2021, according to which only 95 g of CO2/km per new car are permitted. Certain thermoplastic polyurethane (TPU) applications demand the addition of plasticizer to lower the hardness sufficiently. However, the choice of plasticizer can completely change the final properties of the TPU. A study was completed to compare these properties. Various plasticizers were tested in a typical MDI/polyether TPU system and a typical MDI/polyester TPU system. Standard physical property testing was completed for these TPU systems as well as dynamic mechanical analysis (DMA). The relationships between the rudimentary properties of the DMA (storage modulus, loss modulus, tan d) and the measured physical properties were compared. As a result, a rationale for plasticizer selection in TPUs, as well as an appreciation for some of the fundamental physics behind those choices, can be understood. For sealing materials in contact with gases such as hydrogen, a consideration of gas permeability is of elementary importance for the assessment of safety, functionality and reliability. The aim of the presented study is to give an overview of the permeation behavior of thermoplastic vulcanizates (TPV) and ethylene-propylene-diene rubber (EPDM) towards hydrogen under consideration of processing influences. A comparison of TPV and EPDM shows a differentiated permeation behavior. In general, the investigated thermoplastic vulcanizates show a comparatively higher gas permeability than EPDM compared to hydrogen. Processing influences such as weld lines and different manufacturing processes have only a minor influence on the gas permeation of the materials investigated. The mechanical performance of tetrafunctional multigraft copolymers synthesized using an up-scalable anionic synthesis route with polyisoprene (PI) backbone and polystyrene (PS) grafts was investigated. Multigraft copolymers can reach tensile strength values between 7 and 16 MPa in combination with strain at break values in the range 2,000 – 1,270 % and ultimate toughness of approximately 50 – 55 mJ/mm3. Based on these properties they are suggested as suitable candidates in replacing commonly used polymers in the medical sector such as silicone rubbers, plasticized polyvinyl chloride and isoprene-styrene based TPEs with linear molecular architecture.